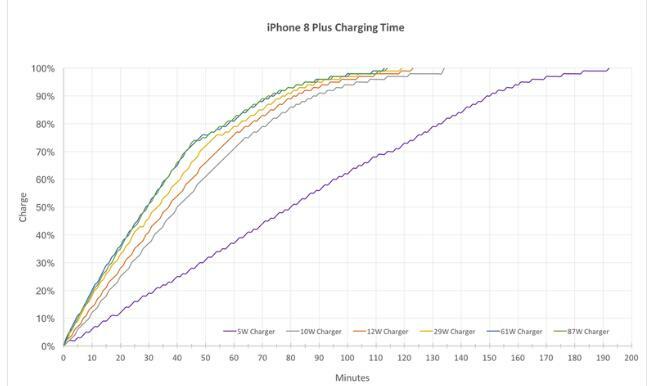 Software engineer Dan Loewenherz shared a chart on Twitter for charging time comparisons for iPhone 8 Plus, with Apple 5W, 10W, 12W, 29W, 61W and 87W iPhone 8 plus chargers, recording the iPhone 8 Plus from 0 to 100% The whole process of charging. This table is a simple interpretation, that is, Apple’s 10W and 12W chargers and Apple’s three original USB PD chargers (29W, 61W, 87W) are not much different from the total time required to fill the iPhone 8 Plus, but the three USB PD chargers are in The starting speed is fast, and the amount of electricity charged in the first half is significantly more, which ensures that enough emergency power is charged in a very short period of time. 3. Apple 29W charger + C-lightning cable, power 15w. It only takes 2 and a half hours to fully charge, and the total price is 90 USD. Therefore, the purchase suggestion we have listed for everyone’s charging program: 12W charger is the most cost-effective, suitable for most users; there is a recommendation for fast charging directly on the USB PD charger, which third-party USB PD charger cost-effective Second only to the 12W charger. Yuda Electronics Co., Ltd. is an original mobile accessories wholesale distributor with 15 years experience, including original wholesale iPhone accessories, wholesale Samsung accessories, and other mobile accessories wholesale, contact us for a free quote.